Here's another one I made for the wee one. Too bad there aren't that many cute patterns for little boys - I was looking to make a few for my wee little nephew. No matter. 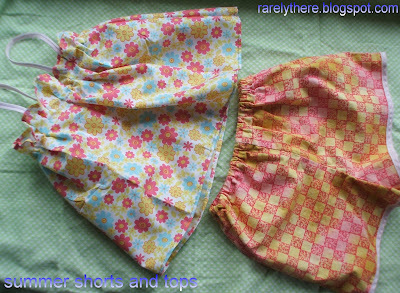 I am glad I can keep making these little girls' clothes for Ana, for now. For the tops, I skimped a little - I just had a 100% cotton fat quarter left from another quilting project and wanted to use it up. And, I had washed and ironed the fat quarter to pre-shrink, so, it just wasn't sufficient for the kind of smocking I wanted, so, I just lazily threw it together. Sometimes, she is a temperamental model and wouldn't let me try on the clothes I made for her. Not this time. She couldn't wait to put them on, and went about playing in the yard all evening, and when it was time to get into her jammies, she threw a fit as she didn't want to take her new clothes off! Both the outfits look great, Sheela.. I made a fushia pink dress too, one that can double up as a top.. Will post about it sometime.